Disclosure: Enkaustikos sent me free samples of Hot Sticks to review for this post. Introducing Hot Sticks the newest product from Enkaustikos. Hot Sticks are ready-to-use professional encaustic paints, the same formula as Enkaustikos Hot Cakes, in a stick format. Hot Sticks are made from Pharmaceutical Grade (USP) beeswax, damar resin, and artist quality pigments. Enkaustikos Hot Sticks are available in 86 artist grade colours some are opaque, some semi-transparent and some transparent for a variety of effects. This new stick shape opens the door to different encaustic application techniques. Enkaustikos kindly sent me a sampling of Hot Sticks to try out and review, the problem was I didn’t really know how to use them without a hotbox. Yes, I knew that I could melt the sticks in a tin on the griddle and use them as I would the Enkaustikos Hot Cakes but I wanted to use them as they were fully intended to be used in the stick format. What is an Encaustic Hotbox? 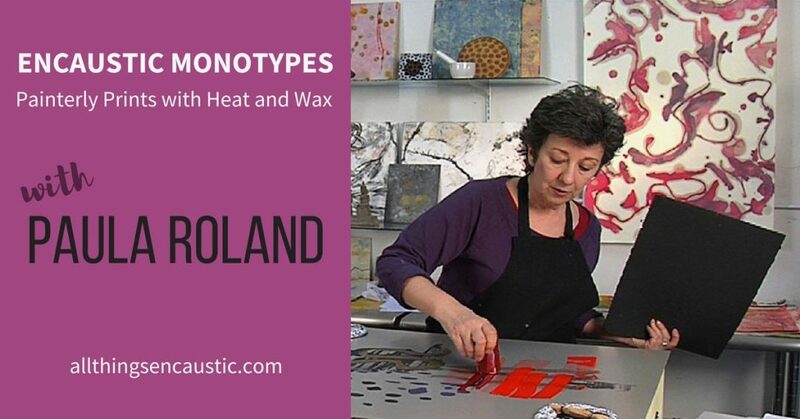 The Roland Encaustic HOTbox was designed by Artist Paula Roland for encaustic monotype printmaking. Four 100 watt incandescent light bulbs heat an anodized aluminum printing plate on top of the box. A light dimmer regulates the light adjusting the plate surface temperature. Without a HOTbox, I knew that if I tried to pull a print from a Teflon-coated griddle, the paint would slide around and bubble up, I could get some interesting effects but I wouldn’t have good control. I have now purchased an anodized aluminum plate made by Enkaustikos and voila my pancake griddle is ready for monotype printmaking. When selecting an anodized aluminum plate, be sure to measure your griddle first! You will instantly see how Enkaustikos Hot Sticks are the perfect format for this form of encaustic printmaking. You can use Hot Sticks to draw directly to the surface of your painting by keeping your paper warm on the plate. You can also paint on the plate and then pull a monotype print from it. No need to fuse… the heat of the plate fuses the encaustic medium to the paper. Here is my work table. Once the griddle is up to temperature and the plate is warm enough to melt the Hot Sticks you can begin to paint. Leave a comment below and let me know what you think of Enkaustikos Hot Sticks. How have you used them? I am very interested in doing some of the encaustics this way. I attended a monoprint encaustic art workshop at The Japanese Paper Place. We experimented with a selection of Washi papers. I suggest you purchase a variety to discover what you like to work with.